It's true... textures are a designer's best friend. They save us countless hours and let us give our work a unique, authentic feel in seconds. The trouble with most textures is that they can be kind of generic or boring. Textures are typically a close up photograph of a surface (for example: crumpled paper). The problem with this is that while the texture can really help your work, it lacks depth. Would you rather use textures that were essentially just macro photos, or would you rather use detailed, hand-crafted, multi-layered works of art to enhance your work? (Hint: we think the second one is about 37,942 times more awesome!). Today we're stoked that we've managed to secure a deal with 2 Little Owls on a killer bundle of handcrafted vintage textures and overlays. These are hands down the most interesting textures we've ever come across. They're everything that you want 'vintage' to be. Typically if you buy a huge texture pack only 10-20 of the textures will be dedicated to a vintage style, and like I mentioned, they'll be pretty generic close up photos of a dusty old book or something. This is crazy, as vintage and grungy textures are the number one textures used by designers everywhere. It doesn't matter what the current trends are, the vintage look is always effective. Make sure and check out the video at the top of the page to see how easy it is to get a vintage look with these textures. These textures and overlays scream authenticity and depth, and this is exactly what they'll give to your work. It's just as easy to apply them (simply overlay them and change a couple of layer settings) but the results are like nothing you've seen. Instead of looking mildly interesting, but ultimately quite flat, your image will come alive with detail. This deal is not only perfect for designers but also aspiring photographers and scrap bookers (these files are 3600x3600 pixels and 300DPI). You only need the most basic design skills to apply these textures, and they'll take your compositions leagues past your peers. 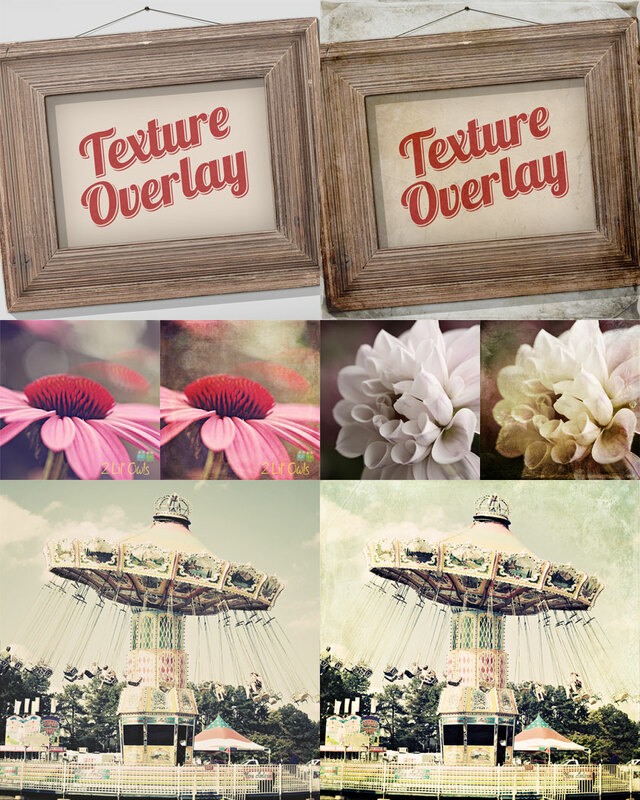 This ultimate vintage bundle includes 100 hand-crafted textures and 18 overlays. The overlays allow you to add super quick tints or bokeh effects to your work. The regular price on these items is $145. For this week only you can grab them all for just $21. Oh, and like always, if you have any questions about using these items we're here to help. Files are delivered as an instant download after you complete your purchase. Download available as a single ZIP file (1.19GB). Files are in JPG or PNG format. View full licensing information for these files by clicking here.